You guys know that I love introducing you all to new bloggers. These two gals are like my soul sisters. 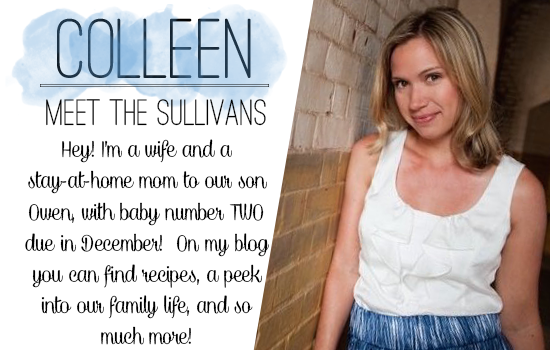 Starting off with the lovely Colleen. Girlfriend is from CA… so am I. She can throw a super duper party… I like to try. She is due with baby #2 in Decemeber… so am I, except baby #3. You will love her blog the second that you lays on it. I promise. --My morning cup of coffee -- It's the only way I can get my day going off on the right foot and I'm usually drinking it with my husband in bed while our son, Owen, is snuggled up in between us. We have baby #2 arriving in December, so I'm enjoying coffee in bed while it lasts! --California living -- We've never lived anywhere else, and I don't see us ever leaving The Golden State. From the diversity to the mild climate to the year-round fresh produce I'm sure it's easy to see why we love it here. --Playing with my dSLR -- I'm still learning, and that's the best part! My photos have come a long way from where I started. I also love capturing my little family and all the fun we have together, as well as all the food I cook! I confess that as much as I LOVE cooking, baking and being in the kitchen I prefer to go out to eat instead! Maybe it's the clean up, cocktails or maybe it's that the food is always so good! Photography for Moms - My Tips! 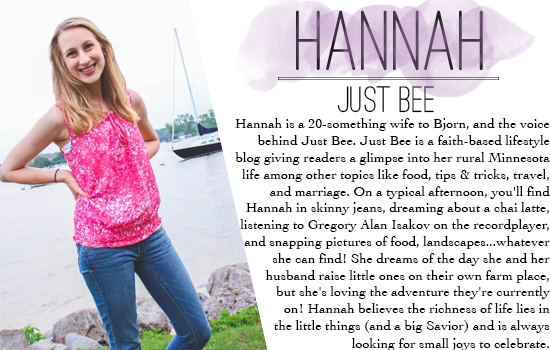 Next up we have Hannah. Smuggled a bullet into an airport… me too. Crazy good DIYer… I wish I was. Her blog is very addicting and a fun daily read. I brought (smuggled?) a bullet to South Korea once. Nbd. ;) I just posted about it! You can read the story HERE. See what I mean, soul sisters! AND we all love playing with our cameras. I love these gals and their blogs. Go and show them some love! !